If you’ve never made a one bowl cake let me introduce you to the easiest chocolate cake you’ll ever make. You can get this cake in the oven in under ten minutes and it uses ingredients you probably have in your kitchen right now. To make it easier the cake is oil based although I’ve made butter versions with lots of success as I know some people don’t like oil based cakes. I will say this though in defence of oil cakes, they keep incredibly well. I recently made a layer cake version of this recipe and it was perfect five days later (thats before I cut into it obviously, as once you’ve cut into the cake it will start to stale slowly. Now the cake is great but boy the frosting I have used is ridiculously good, I challenge to get it all onto the cake with eating at least a few tablespoons of it straight from the bowl, like you did when you were a child, or like you do every time you make a cake if you’re anything like me. I have been making caramel ganache for years, I have a truffle based on this idea in my second book, but I haven’t made any in years. Thankfully my friend Erin from Cloudy Kitchen made a batch for some doughnuts recently and it reminded me how good it was. I followed her lead and made it with milk chocolate but I wanted it as a frosting so whipped the finished ganache which gives it a lighter texture, almost like Swiss meringue buttercream. To really crown the cake I have topped it with with a sprinkling of cocoa nibs and salted peanuts. The nibs give a nice texture and add a great depth of chocolate flavour. 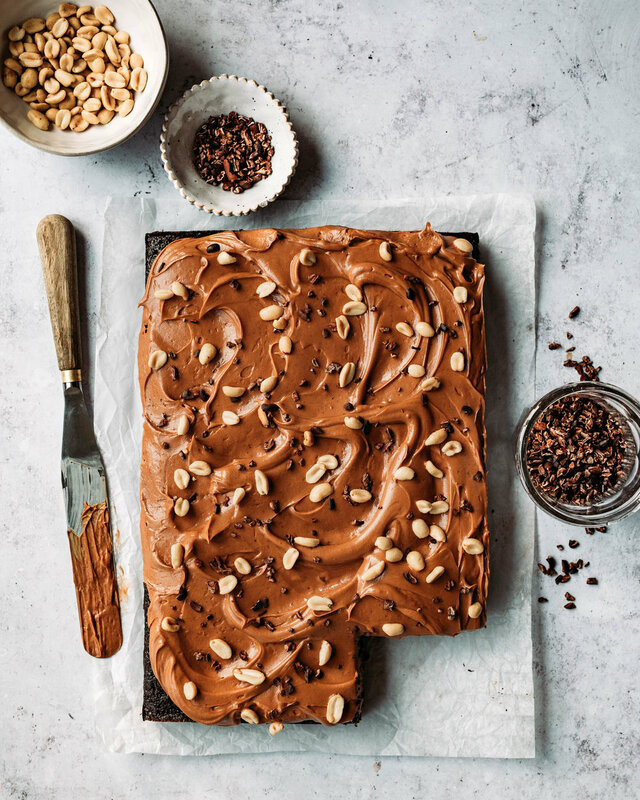 The peanuts obviously give more texture and a little saltiness that balances the sweetness elsewhere in the recipe, plus it also happily gives the finished cake a snickers vibe which is no bad thing. Preheat the oven to 180C/160C fan and lightly grease a 9x13 inch brownie pan, lining with a strip of parchment paper. The excess parchment should hang over the sides of the pan which will make removing the cake a lot easier later. Make the ganache first as it needs a couple hours to chill before whipping. Place the chocolate into a medium bowl and set near the stove. Place the cream into a small saucepan and bring to a simmer. Place the sugar into medium sized saucepan and place over medium heat and cook until melted and caramelised to the colour of a rusty penny. Once caramelised add the butter and salt and stir to combine. Add the cream in two additions, being careful as it will bubble up viciously. Once the bubbling has subsided you should have a smooth caramel, if the cream wasn’t hot enough you may have a couple lumps which will melt if you just pop it back over low heat and stir for a couple minutes. Stir in the vanilla and then pour the hot caramel over the chocolate, set aside for a couple minutes before stirring together to form a smooth ganache. Pop the bowl in the fridge for a couple hours or until thickened. Make sure you don’t leave the ganache in the fridge for too long as it will become too firm to whip, it still needs to be spreadable. For the cake sieve the flour, cocoa, baking powder, baking soda, salt and brown sugar into a large bowl and use a whisk to combine so everything is evenly combined. Make a well in the middle of the bowl and pour in the remaining ingredients and whisk together until a smooth cake batter is formed. Pour the batter into the prepared pan and bake in the oven for about 25-30 minutes or until the cake springs back to a light touch and it is slightly pulling away from the sides of the pan. Because the cake is quite large it is a little harder to manoeuvre than a traditional round layer cake so allow it cool in the pan for 30 minutes before using the excess parchment to lift it from the tin to a wire rack to cool completely. To frost the cake remove the ganache from the fridge and use a hand mixer to whisk until pale and fluffy. This only takes a couple minutes, but be careful not to overdo it as whisked ganache can sometimes go grainy. 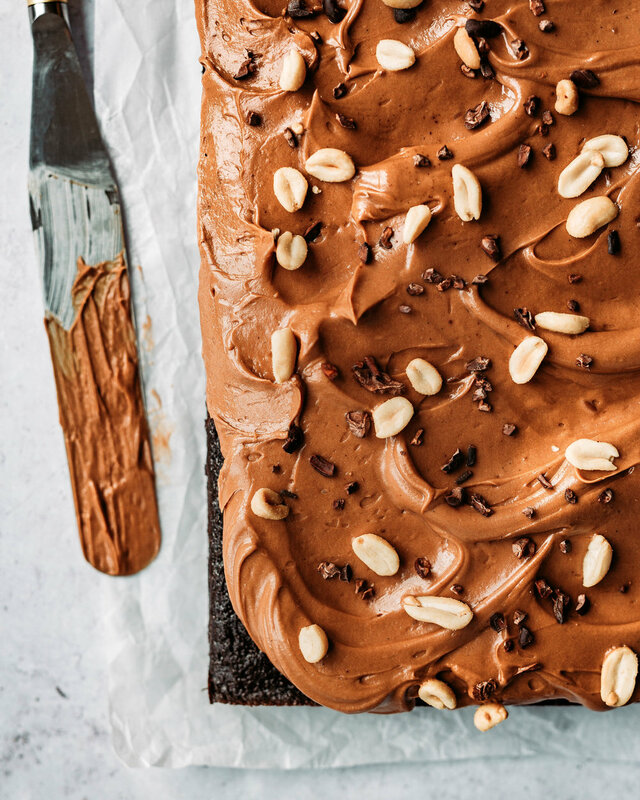 Spread the ganache over the cake and sprinkle with a handful each of salted peanuts and cocoa nibs. Kept in a sealed container this cake will be fine for 4-5 days.